Are you looking for homes in a gated active adult community? Consider Ironwood Country Club in Sun Lakes Arizona. Ironwood is one of five communities in the Robson developed Sun Lakes area. As the fourth generation neighborhood in Sun Lakes, AZ, there are many Ironwood Sun Lakes homes for sale. With less than 1,000 homes, this community is perfect for getting to know neighbors and making new friends. As part of the IronOaks homeowner association (HOA), Ironwood offers plenty of amenities and opportunities to get involved in an active adult lifestyle. 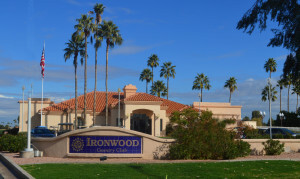 Ironwood Country Club offers just over 700 homes and is situated near the intersection of Riggs and Alma School roads in the East Valley of Phoenix bordering Chandler. Ironwood offers a clubhouse with pro shop, restaurant and bar. Trivia night and sports themed activities are a regular part of the activities you can expect. Ironwood offers an 18 hole golf course, tennis and pickleball courts, fitness center, restaurants, walking paths, lakes and much more. Join in a golf or tennis league or a card club. There is no shortage of activities for as active of an adult lifestyle as you care to have. See all Ironwood Sun Lakes homes for sale below or visit MySunLakesHomes.com for all homes for sale in Sun Lakes AZ.